There’s plenty of places to eat in Worcester and if I’m honest, it’s often that I’ll end up going to places over and over again; especially when the food is cheap and cheerful! Be it a birthday, a break during lectures, a celebration because you’ve finished assignments or just because you and your friends are shopping in town for the afternoon, there are lots of nice places to eat out and it makes a nice change to getting an (often greasy) takeaway when you don’t fancy cooking. BUT ONLY ON A MONDAY! 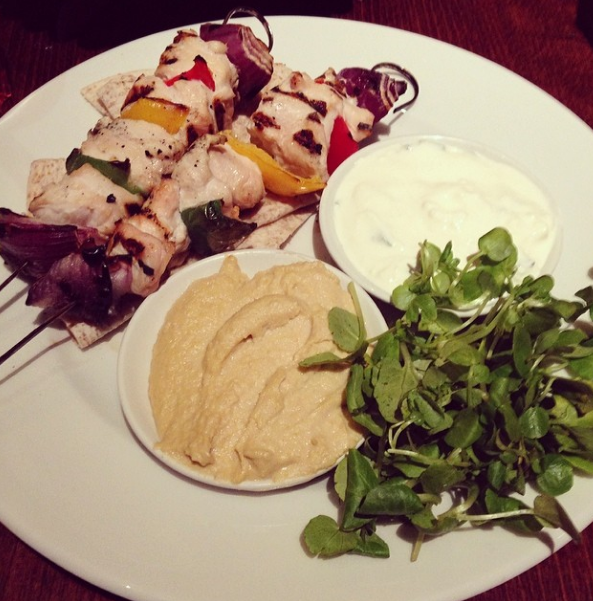 Most importantly, the food is good; I normally always have the chicken and pepper skewers which come with a flatbread. It’s really nice, so would definitely recommend. But the best thing about the Slug & Lettuce is that on Monday’s the food is half price! Drinks remain full price and can be a bit pricey (especially for alcohol) but if you really don’t want to spend much, tap water is always free! Now this probably isn’t a surprise to a lot of you and I’m sure many of you have been before, but if you haven’t, I’d say it’s definitely worth a visit. A friend of mine ordered a sharing platter to himself (supposed to be for up to four people) – there was so much food there and he only had to pay £6! Although I have gone on the weekend and the food has still been good, I can’t help but feel a bit cheated! The Slug & Lettuce is located just opposite Subway and McDonalds on Foregate Street. It’s a massive building so you can’t really miss it! Located in the SU building on St. John’s Campus, Berry’s serves a range of sandwiches, baguettes, baps, jacket potatoes, pasta salads, and nachos as well as tea, coffee and fruit smoothies! Lots of people think they just sell sandwiches because they seem to be the most popular and so did I for a long time! When I was working in the SU shop, I quite often found myself in the SU getting a Sweet Chilli Chicken Pasta Salad (so good, would recommend it to anyone!) to keep me going. It’s actually quite embarrassing because the guys who work there know my order and now I’ll get the meal deal for an extra 30p which comes with a drink and bag of crisps! You can customize your order with sauces and whatever salad you like (similar to going to Subway). It’s good value and really filling. You’ll definitely find yourself getting a Berry’s (probably more than once) during your time at Uni and that’s definitely not a bad thing! Berry’s is not open during the summer, but make sure you check out our new canteen! They make yummy food there! Again, I’m sure it isn’t a surprise to see this with it being one of the biggest chain pubs in the UK, but it’s probably quite ridiculous how often I end up in a Wetherspoons pub, especially since I’ve been at Uni. There are two in the centre of town within 5 minutes walking distance of one another, The Crown which is next to HSBC bank and The Postal Order which is to the left hand side of Foregate Street Train Station. There are regular food deals on and more often than not, the meals come with a drink be it a pint, a glass of wine or a soft drink. And aside from this, there are daily deals on too. 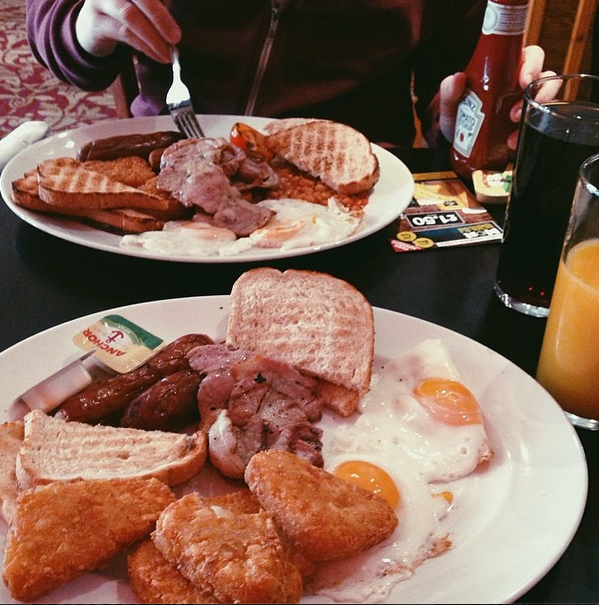 All the daily deals range between £5-7 and again, come with a drink. Even if you don’t fancy food, the prices for drinks are good and often I’ll pop in for a coffee as it’s a lot cheaper than going to Costa! Definitely another firm favourite especially now they have a ‘meal deal’. For £9.99, you can get a refillable soft drink, a main (burgers, chicken, ribs etc.) and an ice cream sundae. I’m pretty sure for a bit extra there are options for you to ‘go large’ and get a bigger dessert if that’s what you fancy. If you don’t fancy the meal deal, the rest of the menu is good value and with all meals, you also get an unlimited salad from the salad cart which comes with sauces and bread rolls. All of this for just under £10. The Timberdine Harvester is just out of central Worcester so you would probably need to go with someone who has a car, but it’s worth going if you get the chance. Again, another place to go if you haven’t got much money but fancy eating out. The food is good (particularly the nachos) and Monday to Friday the food is 50% off a set menu. The set menu is pretty big so there’s plenty to choose from and because it’s half price you can get a starter and not feel guilty! Drinks are cheaper than they are in Slug & Lettuce although it shuts earlier so it’s better to go for lunch as opposed to dinner. In my second year, one of my modules was museum based drama work and so we spent a lot of time at the museums in town and often a group of us would go to Mode to lunch prior to our lecture which was nice. It’s just round the corner from the Hive and in the same complex as Tramps Nightclub (It’s actually a nightclub at night which is slightly weird). There are plenty more places to eat in town. My housemate works at The Green Room which, although it isn’t particularly cheap, is really nice. I feel I should have put down more independent restaurants that can only be found in Worcester in this list because I know there are loads but if I’m 100% honest, I haven’t been to many purely because I know they tend to be more expensive – although I could be wrong! Friar Street, located just behind the main high street is full of lots of quirky independent restaurants that I really want to go to. I’ve heard some good things about a 50s diner called Detroit’s which is situated just next to the racecourse. If I’ve missed any good places off, please do comment below! I wouldn’t recommend Detroit’s. A bit pricey for what you get. Although their milkshakes are insane. Only get one if you have an empty stomach! I recommend Saffron Quarter (down the road from McDonald’s and Subway, towards Foregate). It’s all-you-can-eat for less than £10 Mon-Fri (a bit more on Sundays). They have Italian, Chinese, Indian, Thai and salad dishes to choose from. They also have their own live stir-fry cooking station! You choose what you want stir-fried, hand it to the chef, tell him how spicy you want it, and he’ll cook it for you! Such good food there! And the drinks aren’t too expensive. They also have a little dessert station, and a WHIPPY ICE CREAM MACHINE. You can go up to that as many times as you want, too! Also the conservatory on the same street does gammon, eggs and chips for £5 and most of their meals are £5 or two for £10. Good place for pres too since most of their really nice spirits are double up for £1 and they’re not expensive in the first place either!